Steady-State or Unsteady CFD Simulation? 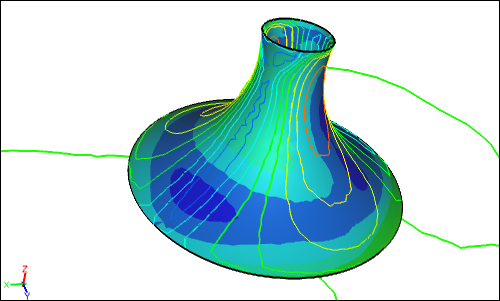 "How do I know in advance whether to perform a steady-state or an unsteady CFD simulation?" is a common question I get asked. The simple answer is, "you don't know" , so I thought I would provide some help on when to use unsteady (also know as transient or time-dependent) simulations. I'll outline a process and tell-tale signs to help you make a guided decision. When you run a steady-state simulation it uses an iterative scheme to progress to convergence. 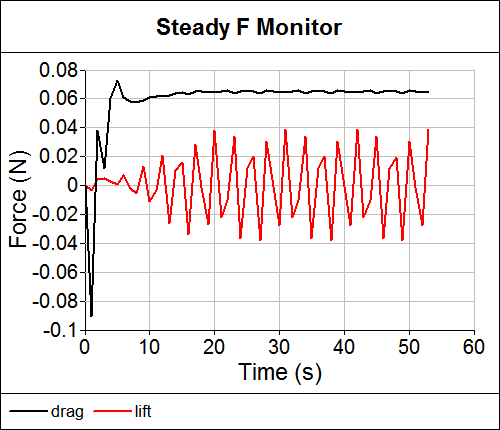 If you see persistent oscillations in the residuals plot (solver diagnostics) and/or oscillations in a key monitor, such as a drag force monitor, with increasing iterations then that's a good indicator the flow may be unsteady (transient) and the simulation needs to be run as an unsteady simulation. 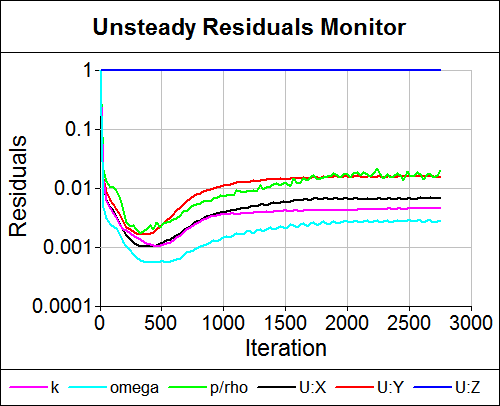 When you are unsure as to whether your simulation is unsteady or steady-state it is always worth running a steady-state simulation first because it typically takes an order of magnitude less CPU time to complete. If the steady-state simulation is sufficient then you'll save a lot of time over running an unsteady simulation. As an example let us examine the residual and force monitors for an unsteady simulation of vortex shedding behind a cylinder and compare them with those generated by the same simulation running, incorrectly, in steady-state mode. Notice the periodic oscillation of lift in the force monitor with increasing time as you'd expect for this vortex shedding example. The residual monitor for an unsteady simulation is useful to see that the solvers are behaving correctly, which is indicated by a relatively smooth variation with increasing iterations. The actual residual values and profiles are not significant. Remember that vortex shedding behind a cylinder is unsteady as described in the previous section, so it is interesting to see what happens when you try to run the same simulation in steady-state mode. Clearly after only 20 updates (200 iterations) there is something wrong, as expected, indicated by the widely oscillating lift force. 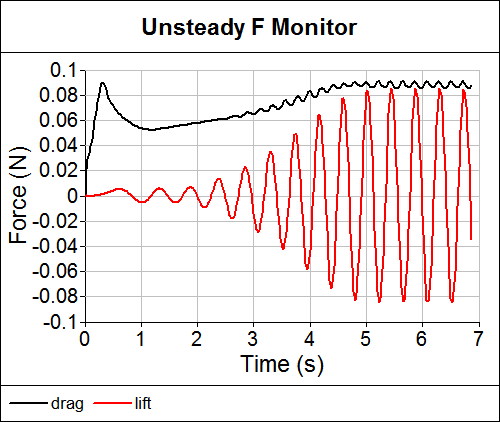 For a steady-state simulation you'd expect some oscillations in the lift force values when you first start the simulation and then see them damp out to a fixed value with increasing iterations. Something is also wrong, as expected, with the residuals. 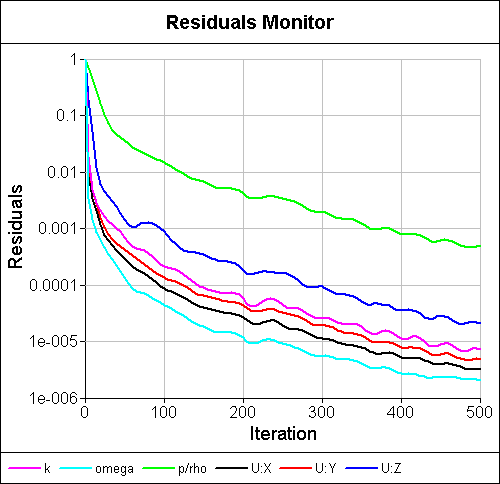 For a steady-state simulation you should see all residuals reduce relatively smoothly toward or below 1e-3 with increasing iterations. For a steady-state simulation the residuals and force profile should be something similar to those in the tutorial "Flow Over a Double-Sided Membrane". 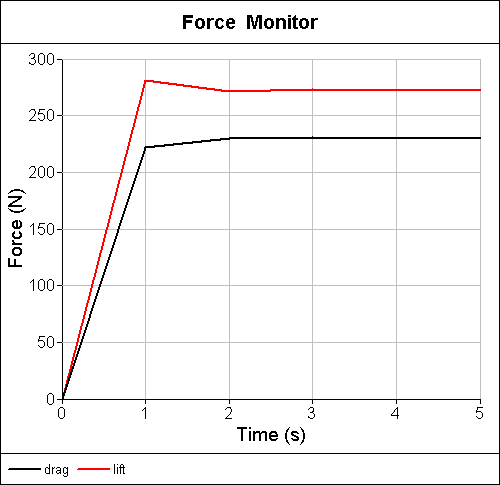 Note the converged lift and drag force values with increasing iterations. 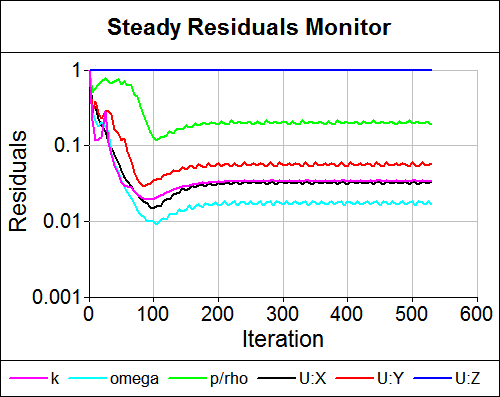 Note the relatively smooth reduction below 1e-3 in all the residuals with increasing iterations. If you run a steady-state simulation for an unsteady flow then you will get poor results, but as I just pointed out there is usually a good indication from the steady-state results that an unsteady simulation was necessary. However, if you find that that your simulation has a steady-state then you can avoid the unnecessary expense of performing an unsteady simulation.